As Minister of State for Energy, Malcolm Wicks is primarily responsible for secure, sustainable and affordable energy for the UK. Mr. Wicks was first elected to Parliament in 1992, and from 2003 was the Minister of State for Pensions. Since becoming Minister of State for Energy last May, Mr. Wicks has been very busy with what could be called the beginning of a new era in the North Sea oil and gas industry, especially in regard to British-Norwegian co-operation. We were fortunate indeed to have the opportunity to ask Mr. Wicks a few questions. You’ve only been in office for a short time, what would you say have been your peak moments in the office? How would you characterise your goals for the office? What would you say is the philosophy behind those goals? The 23rd round once again opens up the entire UK Continental Shelf. Could you say a bit about the strategy behind this focus? “We have a clear idea of what we want – and that is to see as much licensed UK acreage made available for exploration and development as possible. The 23rd Round made the whole of the UK North Sea available and areas West of Shetlands. Of course once further Strategic Environmental Assessments have been carried out, we hope to offer up remaining areas of the UKCS, including in the next – 24th – Round, UK territory in the Irish Sea. Does this strategy indicate that innovation and improvements in technology have now caught up to the demands of fields once considered marginal or end-of-life? “There are a range of reasons why some developments are now possible, but would not have been economically feasible some years ago. Technology has played a part in this, but we have also seen moves by the industry to enhance the commercial environment, speeding up North Sea deals, and improving third party access to infrastructure, and work in partnership with Government to find ways to maximise development opportunities. The new influx of North Sea players, such as Paladin, Apache and Perenco, over recent years has also made an impact on how fields are viewed and produced. I have been extremely impressed by the passion and professionalism across the industry, and the way in which technological and operational challenges continue to be met. Are you currently satisfied with the levels of exploration? Just how important is increased exploration for the development of resources on the UKCS? Could you comment on the “use it or lose it” philosophy concerning awarded acreage – will requirements for development be more stringent? “Government and industry have been very active on the fallow initiative. As I’ve already said, there is an increasing need to utilise existing infrastructure – vital to ensuring that all promising prospects are drilled. It follows that that those holding acreage should also be actively pursuing opportunities. “The fallow initiative is all about getting acreage into hands of those best placed to exploit it. We are working very hard and seeing success. Over 560 blocks and over 230 discoveries have been identified as fallow. This has already led to activity on 135 fallow blocks and 41 discoveries, with 45 wells drilled and 12 development plans coming forward. Has this new round generated interest in newer companies and companies that have not previously shown an interest? “On licensing, the signs are extremely encouraging – we have just seen a record number of block bids in our latest, 23rd, Offshore Round with applications for a total of 279 blocks – the most for 30 years. 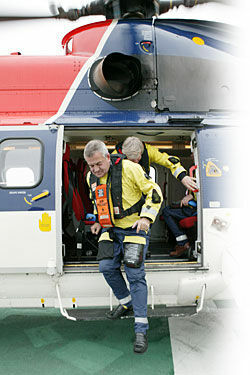 The applications are from a range of companies including some firms which, if successful, would be new to the North Sea. “The last two Rounds prior to this, which introduced the ‘promote’ licence a tenth of the cost of the traditional licence, and the ‘frontier’ licence, aimed to promote increased exploration and appraisal activity West of the Shetland Islands, were also very successful. Signs are promising – but we could always do with more quality exploration. “These licensing innovations have provided opportunities for a wider range of companies to invest here and we have attracted record numbers of new entrants – issuing 58 new ‘promote’ licences last year, with 15 companies new entrants to North Sea. Last year we awarded a total of 97 licences, the highest number for 10 years. These covered 163 blocks, including 41 West of Shetland, with 26 blocks via new frontier licence. Norway signed a new treaty concerning cross-boundary petroleum co-operation in April, and the first announcement of the Enoch and Blane field development came in early July (as well as Boa and Playfair). Could you comment on the “fast track” process that has been made possible by the treaty? What do you feel will the most significant affect of this agreement over time? “The Treaty stems from an industry recommendation that UK and Norwegian Governments clarify the regulatory regime for future transboundary projects, thus avoiding the need for individual treaties for each project. Enoch and Blane are the early fruits of the Treaty. Langeled is one specific example of cross-boundary pipelines for transportation. Can we expect to see even more exports to the UK? “The UK became a net importer of gas on an annual basis towards the end of last year and our import dependency will increase progressively. The Langeled South pipeline will considerably increase Norway’s capability to deliver gas to the UK and will add significantly to the UK’s future security of energy supply. “Further pipeline links between Norway and the UK are indeed already happening and we have recently approved the new link between the Statfjord field and the UK FLAGS pipeline that will provide further volumes of Norwegian gas. I believe that the UK and Norway need to continue to work closely together to maximise North Sea opportunities, including those as yet untapped accumulations around the median line. Norway and Russia have recently signed an agreement of cooperation in light of developments in the Barents Sea. Are you planning or discussing closer co-operation with Russia or a new UK-Russia agreement? What about the future? What are the greatest challenges that face all those involved in the UK/Norwegian Continental Shelf in the coming years? “I think much of what I have said above highlights many of the challenges likely to be facing us during the coming years. I think the key ones for the UK are to maintain secure energy supplies, and to make sure we realise the full potential of the UKCS, including our brownfields. In parallel of course there are other issues such as reducing harmful emissions, ensuring the proper and timely handling of decommissioning, and maximising the potential of infrastructure to bring in firm supplies from outside of the UK.